When Gen. Albert Sidney Johnston had united his forces from Nashville with those collected under General Beauregard at Corinth--the latter including the reinforcements from Pensacola and Mobile under General Bragg, and Polk's command from Columbus, which was evacuated--he organized his army with Gen. G. T. Beauregard second in command, and Maj.-Gen. Braxton Bragg chief of staff and in immediate charge of the Second corps. Maj.-Gen. Leonidas Polk commanded the First corps, Maj.-Gen. W. J. Hardee the Third, and Maj.-Gen. John C. Breckinridge the Reserve corps. The Tennesseans were assigned as follows: In Polk's corps, First division, Brig.-Gen. Charles Clark commanding--the Twelfth, Thirteenth and Twenty-second regiments, and Bankhead's battery, to the First brigade, Col. R. M. Russell; the Fourth and Fifth regiments to the Second brigade, Brig.-Gen. A. P. Stewart. Second division, Maj.-Gen. B. F. Cheatham commanding--the Second (Knox Walker's), Fifteenth, One Hundred and Fifty-fourth (senior), and Polk's battery, to the First brigade, Brig.-Gen. Bushrod R. Johnson; the First, Sixth and Ninth to the Second brigade, Col. W. H. Stephens. In Bragg's corps, the Thirty-eighth regiment was assigned to Col. Preston Pond's brigade of Ruggles' division; the Fifty-first and Fifty-second to Brigadier-General Chalmers' brigade of Withers' division. In Hardee's corps, Brigadier-General Cleburne's brigade included the Thirty-fifth, Twenty-third and Twenty-fourth regiments, and Brig.-Gen. S. A. M. Wood's brigade, the Twenty-seventh, Forty-fourth and Fifty-fifth. The Reserve corps had the Nineteenth, Twentieth, Twenty-eighth and Forty-fifth regiments, and Rutledge's battery, in the brigade of Col. W. S. Statham, and Crew's battalion, in Col. R. P. Trabue's brigade. Forrest's cavalry was under the immediate orders of the general commanding. At 11 a.m. of the battle of the 6th, when Gen. Bushrod Johnson was disabled by a painful wound, the command of the brigade devolved upon Col. Preston Smith, of the One Hundred and Fifty-fourth Tennessee, and the command of that gallant regiment upon Lieut.-Col. Marcus J. Wright. At 2:30 p.m. of the same day, Col. George Maney, senior officer of Stephens' brigade, assumed the command of it; and Maj. Hume R. Feild, next in rank present, took command of the First Tennessee. Polk's corps, with the exception of Blythe's Mississippi, the Eleventh Louisiana and the Thirteenth Arkansas, was composed entirely of Tennesseans. Colonel Lindsay's Mississippi regiment of cavalry reported to General Polk. This splendid regiment had been known up to this date as Miller's battalion, Lieut.-Col. J. H. Miller commanding. On the 3d day of April General Johnston issued an address to the troops, in which he announced, "I have put you in motion to offer battle to the invaders of your country." Hon. Jacob Thompson, of Mississippi, aide to General Beauregard, in his report of April 9th states that this advance was made "in consequence of the information brought. from General Cheatham," who occupied Bethel Station and the town of Purdy with his division. 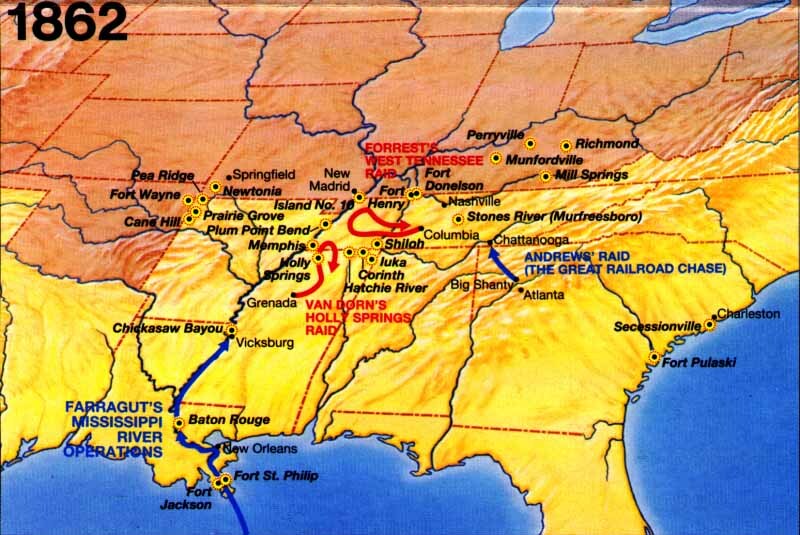 In the attack about to be made on General Grant, General Johnston expected to beat him back to his transports and there capture him and his forces, then cross the Tennessee river and give battle to Buell, known to be advancing to Grant's assistance. General Johnston rapidly concentrated his troops and delivered battle in the early morning of the 6th of April. That peerless soldier was in immediate and active command of the troops, General Beauregard being at his quarters in very feeble health, and his presence inspired unbounded enthusiasm. The disasters at Fishing creek and Forts Henry and Donelson had subjected him to the criticism of politicians, but the army and intelligent people of all classes gave him support and confidence. No fault can be named in his plan of attack, and it was successful at all points. Grant's troops made a stout resistance, but retired slowly from the moment of the firing of the first gun by Hardee until the fall of Johnston at 2 o'clock p.m., when the battle of Shiloh was already won and the Federal hosts were driven back in confusion from the field. Gen. James R. Chalmers, who occupied the advance of the Confederate army at the close of the day, in a published letter, said: "One more resolute movement forward would have captured Grant and his whole army." That movement was not made. The troops were withdrawn to receive an attack from the combined forces of Grant and Buell on the following day. Another battle of Shiloh was fought, with varying success, until our forces began to yield about noon, and at 2 p.m. received orders from General Beauregard to retire. Tennessee was represented on all parts of the field and in all commands. Her sons sustained and promoted the character and reputation of the State, and elevated the standard of courage, fidelity and patriotism. Their death-roll shows that they were in the fore-front of the battle, and with a single exception there was no failure of duty. That exception was the Fifty-second regiment of infantry, Chalmers' brigade, which was unfortunate in its field officers. General Chalmers, in his official report, stated that the Fifty-second Tennessee, except two companies under Capts. J. A. Russell and A. N. Wilson, who fought with the Fifth Mississippi, behaved badly. The sons of Tennessee, of every rank, were conspicuous for dash and steadiness in action, and for the maintenance of regimental and company organizations under all conditions. General Beauregard, in his report, made honorable mention of Generals Cheatham and Bushrod Johnson; and General Polk, referring to the brigades of Johnson and Russell and their charge on Sherman's division, and to the valor of friend and foe, mentions the dangerous wounds received by Generals Clark and Johnson, the death of the noble Col. A. K. Blythe of Mississippi (a son of Tennessee); the wounding of gallant Capt. Marsh T. Polk, who lost a leg; and the final dislodgment of the enemy and the capture of two batteries, one by the One Hundred and Fifty-fourth Senior Tennessee, Col. Preston Smith, the other by the Thirteenth Tennessee, Col. A. J. Vaughan, Jr.
Polk also called attention to the "brilliant courage" of the Fifth Tennessee, Col. C. D. Venable, and the Thirty-third Tennessee, Col. Alex. W. Campbell, and to the gallantry of Lieut.-Col. O. F. Strahl, who, in reply to the inquiry of his intrepid brigade commander, General Stewart, "Can you take that battery?" said, "We will try," and at the order, Forward, moved at a double-quick to within thirty paces of the enemy's guns, halted, delivered one round, and with a yell charged the battery, capturing several prisoners and the guns; but the valorous Fourth lost Maj. John F. Henry and Capt. John Sutherland, with 31 men killed and 150 wounded. The battery captured was composed of heavy guns, supported by several regiments of infantry. Of another famous incident of the battle, General Polk reported that about 5 p.m. of the 6th, his line attacked the enemy's troops (the last that were left upon the field) in an encampment on his right. The attack was made in front and flank. The resistance was sharp but short, when the enemy, perceiving he was flanked and his position completely turned, hoisted his white flag and surrendered with his command, 2,200 strong. The Federal commander's sword being delivered to Col. R. M. Russell, commanding First brigade, it was found the forces captured were those of Brig.-Gen. B. M. Prentiss, Sixth division of Grant's army. At 8 a.m. of the 7th General Polk ordered Cheatham's division, reinforced by the Thirty-third and Twenty-seventh Tennessee, and Gibson's Louisiana brigade, to move "past Shiloh church to form on left of our line." "They engaged the enemy so soon as they were formed and fought him, for four hours, one of the most desperately-contested conflicts of the battle. The enemy was driven gradually from his position." General Cheatham declared that this conflict was "the most hotly contested I ever witnessed." He had met fresh troops under McCook. General Polk made honorable mention of Generals Cheatham, Clark, Stewart and Johnson, and Colonels Russell, Maney, Stephens and Preston Smith. Of General Cheatham he said: "In the operations of this morning (the 7th), as well as the clay before, those of my troops under the immediate orders of Major-General Cheatham bore themselves with conspicuous gallantry. One charge particularly was made under the eye of the commander-in-chief and his staff, and drew forth expressions of the most unqualified applause." Cheatham carried into battle 3,801 officers and men. He lost 1,213 killed and wounded, nearly one-third of the command. Among the killed was noble young John Campbell, acting aide; Colonel Wickliffe and Major Wel-born, Seventh Kentucky; Capts. J. B. Freeman and G. G. Persons, and Lieut. Isaac M. Jackson, Sixth Tennessee; Adjt. Robert Thomas, Ninth Tennessee; Capt. E. M. Cheairs, One Hundred and Fifty-fourth regiment, and others not reported. Colonel Pond, commanding brigade, in his report of the battle makes honorable mention of Col. Robert F. Looney, Thirty-eighth Tennessee. Colonel Looney in his own report states that he was ordered by General Polk to charge a battery and camp on the morning of the 6th, and "I ordered the charge, which was promptly and successfully executed as to the camp and battery, and I suppose at least 1,000 prisoners." Col. D. H. Cummings, Nineteenth Tennessee, Reserve corps, had been on detached service, with the First Tennessee, under orders from General Johnston; at 2:30 p.m. of the 6th, he reported through his adjutant, Melville Doak, to General Cheatham, and was now advanced, with the First and Ninth Tennessee under Colonel Maney, to a final attack on the only position held by the enemy in Cheatham's front. The enemy was routed and fled the field. Lieut.-Col. J. H. Miller, with his battalion of Mississippi cavalry, was ordered by Cheatham to fall upon him in his flight. This resulted in the capture of Ross' Michigan battery of six guns, with officers and men. Colonel Cummings made no report, neither did Colonel Statham, commanding brigade, but it is known that the Nineteenth was an active participant in all of the stirring events of the two days' battle, and bore an honorable part in the movement resulting in the capture of Prentiss' division. It lost 25 per cent. ; among the wounded being Colonel Cummings and Major Fulkerson, and in the list of killed, Capts. Z. T. Willett and Thomas H. Walker. Hardee, who opened the battle of the 6th at dawn of day, stated in his official report that in the first assault made by Cleburne, "Colonel Bate, Second Tennessee, fell severely wounded while bravely leading his regiment." Colonel Bate was afterward brigadier and major-general. At the same time, gallant Maj. W. R. Doak and Capts. Joseph P. Tyree and Humphrey Bate, and Lieuts. E. R. Cryer, J. A. Akers and G. C. Fugitt, of the same regiment, were killed. In the attack on the left center of General Hardee's line, "Brigadier-General Wood charged a battery on a gentle acclivity and captured six guns, with the Second (Bate's) and Twenty-seventh Tennessee and Sixteenth Alabama. In this attack Col. Christopher H. Williams of the Twenty-seventh Tennessee was killed. The army and the Confederacy sustained a severe loss in the death of this gallant officer." General Wood, referring in his report to that noble man and to the same charge, says: "Colonel Williams, of the Twenty-seventh Tennessee, a modest, unassuming gentleman and Christian soldier, faithful in every duty, devoted to his country, his native State, and the cause of liberty, fell and died. Lieutenant-Colonel Brown of the same regiment was seriously wounded; Captain Hearn and Lieutenant Henry were killed." Maj. Samuel T. Love of the Twenty-seventh, serving under Cheatham on the 7th, was killed in a charge on the enemy. General Cleburne made honorable mention of Colonel Bate, and said of his regiment: "Tennessee can never mourn for a nobler band than fell this day in her Second regiment." He refers in terms of praise to Col. Matt Martin, Twenty-third Tennessee, who arrived on the field pending the action, rallied his regiment and remained with it until wounded later in the day; also to the Twenty-fourth Tennessee, which he said "won a character for steady valor, and its commander, Lieutenant. Colonel Peebles, showed that he possessed all the qualifications of a commander in the field." The Thirty-fifth Tennessee, Col. Benjamin J. Hill, was conspicuous in Cleburne's first and final charge on the enemy. General Cleburne, concluding his report, said: "I would like to do justice to the many acts of individual valor and intrepid daring during the fight .... Col. Ben Hill, Fifth Tennessee; Lieutenant-Colonel Peebles, Twenty-fourth Tennessee; Lieut. R.. H. Keeble, Captain Ridley and Lieutenant-Colonel Neil of the Twenty-third Tennessee, were among the number." General Wood reported that "Col. C. A. McDaniel, of the Forty-fourth Tennessee, acted with great bravery and directed his men with good judgment until wounded on Monday." In his own report, Colonel McDaniel said that Lieutenant-Colonel Shied, of his regiment, was badly wounded on the 6th, and that "his officers and men conducted themselves gallantly and chivalrously." The Fifty-fifth Tennessee, Col. William McKoin, was in Wood's brigade, and held the right of Wood's line in the successful attack of the early morning on the enemy's camp. Of Lieut.-Col. J. M. Crews, of Crews' battalion, Colonel Trabue reported that he "behaved well." The battalion lost 55 in killed and wounded. Forrest's regiment of cavalry added renown to the reputation made at Fort Donelson. He was in advance of Breckinridge as he moved out of Corinth, covered the flank of our army with the greatest intelligence and courage, and participated in the movement which forced from Prentiss all support on his left. On the morning of the 7th he gave notice of the advance of Nelson's division, made a dash at his skirmish line, captured 50 prisoners, and held the enemy in check until ordered by General Hardee to retire. Colonel Forrest was with Breckinridge in covering the Confederate retreat to Corinth, and in a combat with the Federal advance was severely wounded. After the abandonment of the capital of Tennessee, Gov. Isham G. Harris determined to promote the cause of the South at any sacrifice. No effort was left untried to induce continued enlistments in the army, and every possible encouragement was offered to our people, in the districts outside of the Federal lines, to continue the production of supplies for the army. Hearty responses were made to these calls, and the spirit of resistance was stimulated by the governor's words and personal example. So soon as the army was concentrated at Corinth, he reported for service to General Johnston and was assigned to duty as aide-de-camp. He was with the general on the field of Shiloh, in the active performance of duty, and present when that great chieftain received his death-wound. In General Beauregard's report of the battle it is recorded that "Gov. Isham G. Harris, of Tennessee, went upon the field with General Johnston, was by his side when he was shot, aided him from his horse, and received him in his arms when he died. Subsequently the governor joined my staff and remained with me throughout the next day, except when carrying orders or employed in encouraging the troops of his own State, to whom he gave a conspicuous example of coolness, zeal and intrepidity." The Forty-seventh Tennessee regiment, Col. M. R. Hill, arrived on the field on the morning of the 7th and reported to General Polk. It was poorly armed with sporting rifles and shotguns, and before going into action was conducted by a staff officer of General Cheatham to the point where Prentiss surrendered, and was at once armed with new Springfield muskets, and supplied with ammunition, from the Federal store. It turned these guns upon the enemy, and made a good record with Cheatham (attached to the brigade commanded by Col. Preston Smith) in his battle with McCook's division of Buell's army. There were three battalions of regulars in Rousseau's brigade of this division, and of Buell's loss of 3,753, the heaviest part was sustained by McCook in his combat with Cheatham. The Tennessee artillery--Bankhead's battery, Capt. Smith P. Bankhead; Polk's battery, Capt. M. Y. Polk; Rutledge's battery, Capt. A. M. Rutledge--rendered conspicuous and valuable services. General Wood, reporting the battle of the 7th, testified that when "large masses of the enemy were coming up and pressing my right, a battery, which I afterward learned was commanded by Captain Rutledge, came up to this point and held them in check for more than half an hour." Captain Polk was seriously wounded on the 6th; Stanford's Mississippi battery served with Stewart's brigade and rendered good service. Capt. Melancthon Smith's battery, composed of Mississippians, was attached to Stephens', afterward Maney's, brigade. It entered the service with Cheatham and was mustered into the provisional army of Tennessee. It was with Cheatham on the 6th and in his battle of the 7th with McCook, and was referred to by General Cheatham as having rendered "splendid service," Captain Smith and his officers and men being "distinguished examples of gallantry." Captain Smith was afterward major and colonel of artillery. The battery continued with Cheatham until after the battle of Nashville, under the command of Lieut. W. B. Turner, made captain after Chickamauga. On the field of Shiloh, Captain Smith exchanged his 6-pounder guns for 12-pounders captured from the enemy. General Cheatham reported the death of Colonel Blythe and Lieutenant-Colonel Herron of Blythe's Mississippi regiment, and the wounding of Gen. Bushrod R. Johnson, Col. R. C. Tyler (afterward brigadier-general) of the Fifteenth Tennessee, and Captain Polk. Maj. R. P. Caldwell, Twelfth Tennessee, conspicuous for his bearing, reports that after the commissioned officers of companies B and G had all been killed or disabled by wounds, Private A. T. Fielder took charge of them "and led these two companies all day in the thickest part of the battle." Lieut.-Col. F. M. Stewart and Capt. W. Dawson, Twenty-second Tennessee, were severely wounded. The Thirteenth lost 137 killed and wounded, among the former, Lieuts. C. H. Whitmore and W. F. Cowan. Col. A. W. Campbell of the Thirty-third, afterward brigadier-general, reported that Maj. Henry C. McNeill displayed "throughout a cool bravery rarely equaled." The regiment lost 123 killed and wounded. Col. Preston Smith reported that the officers and men of his brigade conducted themselves well and courageously. The One Hundred and Fifty-fourth Tennessee lost 188 in killed and wounded. The great body of the Tennessee troops never fought better than at Shiloh. Though many of them had little training, they fought in the open field and exhibited remarkable steadiness and readiness to obey orders. While company and regimental organizations were observed, it was next to impossible to maintain brigade and division organizations. The field seemed to be full of roving staff officers begging for a regiment to support a hard-pressed part of the line. In many instances they assumed to be clothed with authority to order a regiment from its own brigade to another. The consequence was that in a few hours after the opening of the battle the efficiency of the troops was seriously affected, and some of them were made the victims of great injustice. The retirement to Corinth was made in good order. No pursuit was made or attempted. General Beauregard reports the Confederate loss at 10,699. Swinton fixes the loss of Grant and Buell in killed, wounded and captured, at 15,000. The battle becomes tangible as Foote interweaves the observations of Union and Confederate officers, simple foot soldiers, brave men, and cowards and describes the roar of the muskets and the haze of the gun smoke. The author's vivid storytelling creates a rich chronicle of a pivotal battle in American history.